"The performance of Sub-Saharan African economies over the past decade has inspired optimism on the region’s prospects. But the region still faces major development challenges, and it is now clear that the majority of its countries will not achieve key millennium development goals. A key constraint to SSA’s growth and development is the shortage of financing. At the same time, the sub-region is a source of large-scale capital flight, which escalated during last decade even as the region experienced growth acceleration. The group of 33 SSA countries covered by this report has lost a total of $814 billion dollars from 1970 to 2010. Boyce and Ndikumana compare this to the level of development aid and foreign direct investment received by these countries. 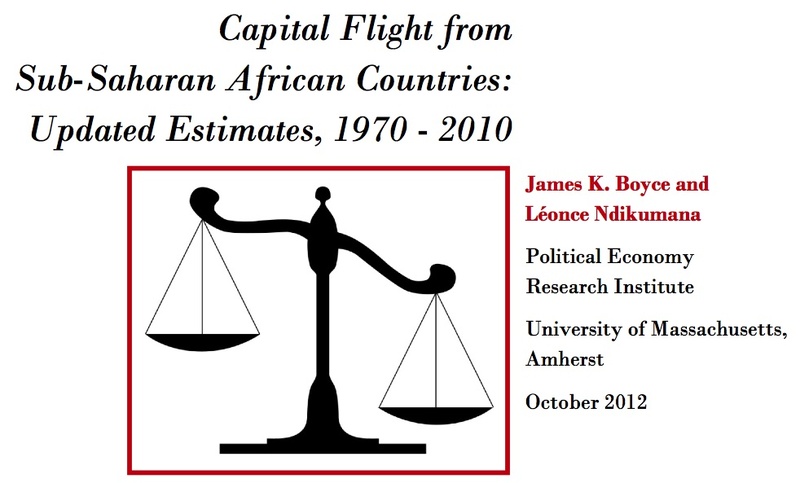 Assuming that flight capital could have earned the modest interest rate measured by the short-term U.S. Treasury Bill rate, they find that the accumulated stock of capital flight far exceeds the external liabilities of this group of countries, making the region a “net creditor” to the rest of the world. This is an important new piece of research. It follows some research of theirs which we recently blogged (original here) exploring capital flight from North African countries.